Lucy, Laura, Bonnie and I just love Christmas! Mostly we LOVE being Santa's little Elves. Go see us in our wonderful Elf Glee! Well who knew! I'm Oak Goblinshimmer!!!! A friend of mine in my Monday night sewing group starting making the pattern "Follow the Drinking Gourd" by Barbara Brackman a few weeks ago. She emailed me to see if I had any dark blues and butternut colored reproduction like fabrics she could have to give her quilt more variety. It made me realize how many browns I have and how few dark blues! But I fell in LOVE with the picture of her quilt in progress and picked up a few blues to share and she in return shared some of her blues so I could make my own version! The pattern is 15" blocks, but she sized them down to 12". She also figured out the sizes for an 8" version. Well I decided I was going to do the 8" version. So above are my 6 blocks so far. Not too bad considering I really didn't sew to much this week with the girls home. 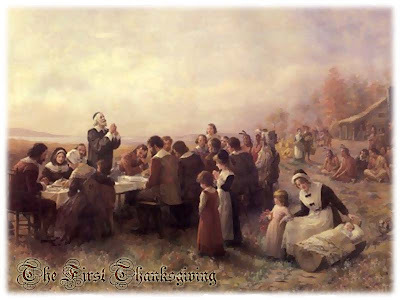 We had a great Thanksgiving and had a lot of fun. Of course we did some shopping, mostly for stuff for them! And we went out to eat and to a movie "Dan in Real Life" with Mark's sisters. That was a great time. Now I"m sitting home just kind of sad and lonely. I always have this big let-down when they are gone. I miss them already. I found out that Gypsy Quilter gave me the Community Blogger Award! Now how nice is that! Picture from The Sadie Peterson Delaney African Roots Library. "The Community Blog Award celebrates people who reach out and makes the blogger community a better one." In turn, I get to pass this on to 3 folks - this is always the really tough part for me. There are so very many blogs I could choose! So don't feel bad if I didn't choose you this time, because there is no way I could list everyone! 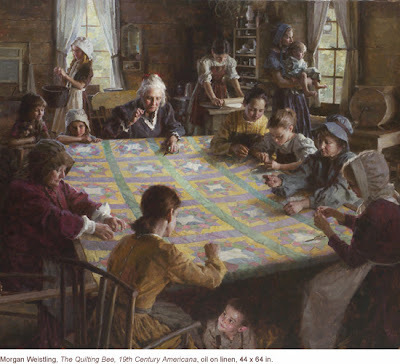 Lucy at Quilting with the Past - Lucy is so very talented and sweet. And this week I received a special envelope with some vintage dutch mourning fabric for a secret project I'm working on right now. It is so perfect and I would be so lost without her friendship and support. Laura from Pine Ridge Quilter - Laura is another of those friends you can't do without. I"m lucky enough to know Laura in person and she is always there for me when I need a shoulder to cry on and a sounding board for my quilting. My trips to go visit her are my highlights throughout the year. Nancy at Tom Miner Folk Art - I"ve been online with Nancy since it seems the beginning of time. Nancy does wonderful folk art quilting and live in the middle of nowhere Montana. Oh I envy her house and area! She always has some great story about her husband Jim and his follies! It keeps me laughing! As you've noticed I've been a bit quiet lately - doing lots of "secret projects" for Christmas, and the kids started arriving home last night! So it will be at least a week before I'm back with anything to show. 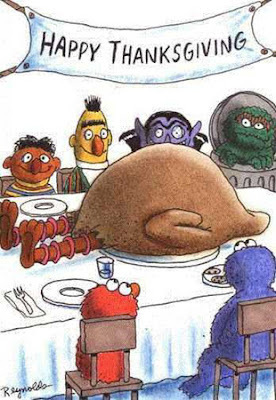 So - until then - Happy Thanksgiving everyone! 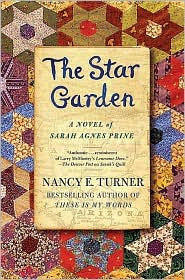 I enjoyed Sarah's Quilt so much that I had to get the next book - "The Star Garden" by Nancy E. Turner. I"m only about 20 pages in and already I love it! And since what I"m working on lately I can't share because it is a surprise Christmas present - I thought this was the perfect time to do the meme on Jeanne's blog. "Why, she didn't know who he was." Now how is that going to draw you in! I finished quilting all 4 of the Nativity quilts this weekend! Put on the bindings and sleeves this morning! All I need to do is sew them down by hand now in front of the TV! Cross one more "have to do" off my list! We had voting Wed night at my quilt guild for the quilt we are going to make for our 2009 Quilt Show Raffle. A member who is as big a Bonnie fan as me had asked Bonnie if we could vote/use her Cathedral Stars pattern. Bonnie in her wonderful giving fashion said yes. 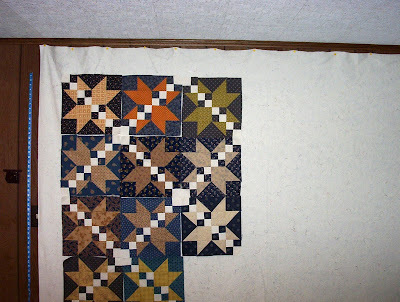 Well the votes are in - our raffle quilt for the 2009 show is her Cathedral Stars! A few of us made up demo blocks for the voting to help members see what it would look like. Aren't they great, even with us just doing them with not a lot of planning! Above is another Christmas gift almost ready! All I need to do is sew down the binding on the back! 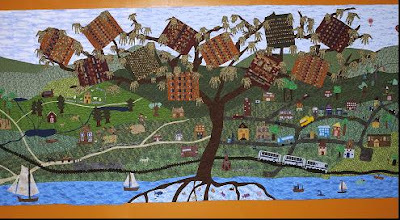 This was the mystery quilt Laura organized at camp this fall. 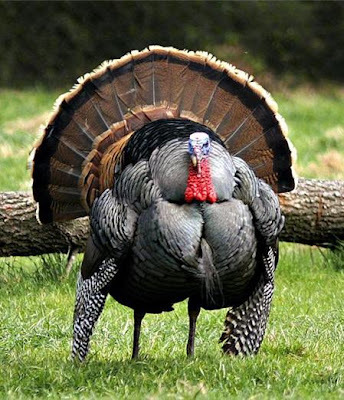 I have until Christmas to get that done so it shouldn't be a problem. I"m currently reading "Sarah's Quilt" by Nancy E. Turner. It took me a bit to get "into character" but once I was - I was hooked! I'm really enjoying it! Of course I have no idea what Sarah's Quilt has to do with the story YET! And I see there is a follow-up book out this month to it, I can't wait to get it! That one is called "The Star Garden". (Hmm, looks like there was a book that comes before Sarah's Quilt too). underneath, and then as soon as you get it down, there are all the colors. Just think of all the images, designs and feelings those words bring to you! And all the thoughts of quilts made by hand in small houses by lamp light. Making quilts for warmth and comfort. 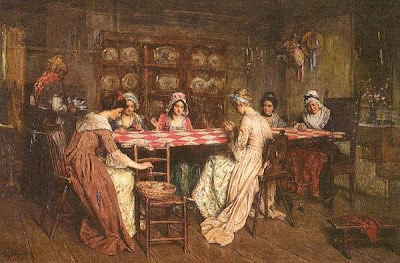 Quilting out of scaps for necessity, and quilting bees as social gatherings. 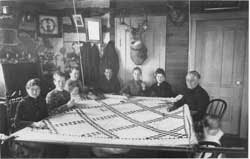 Can you imagine HAVING to make a quilt and finding time to do it in order to stay warm. Its probably why I love antique utilitarian quilts so much! Yup, I"m around - just busy, busy, busy! DO NOT mention the words Server, Crash, Backups, Reload, Security to me right now! Yeah, I"ve been busy - but not with quilting. It has been all work, all the time! But my friend did help me out and quilted my 3 braid table runners I made for me! I was just going to stipple them, but the way things are going, I decided to let her play with her new statler stitcher and do them for me! I"m glad I had her do them! I"m that much closer to being done with them for xmas presents!!! I got the binding on, just have to hand sew them down now!